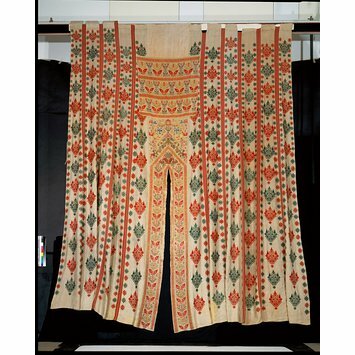 When purchased, these two panels (67, 67A-1902) were stitched together, and an opening had been left at the bottom by unstitching part of one seam. Formerly in the possession of the Platanistas family in Kos, Greece. Purchased. Registered File number 12911/1901. For general remarks: see R.P. (File) 17833/1901, 35917/1901, 6567/1902, 80473/1902. As in Rhodes, the bed tent door has horizontal strips over the gable which, according to Wace (BFAC Cat. p. xix) were known locally as the koumbasu. These strips were normally decorated with units of King and Queen pattern alternating horizontally. Most doors had a single gable as here, other had two or even three (Cook Coll. No. 51, also illustrated Johnstone Pl. 60.) The Koan door, unlike in Rhodian, appears in general to have had no horizontal inlets half way down, but Wace (Cook Coll. p. 26.) mentions an example in the Academy of Arts of Honolulu which has this feature. The side panels of a Koan door were filled with alternate King and Queen patterns, an arrangement which was also used in Rhodes, but in a more solidly embroidered, less clearly defined form. 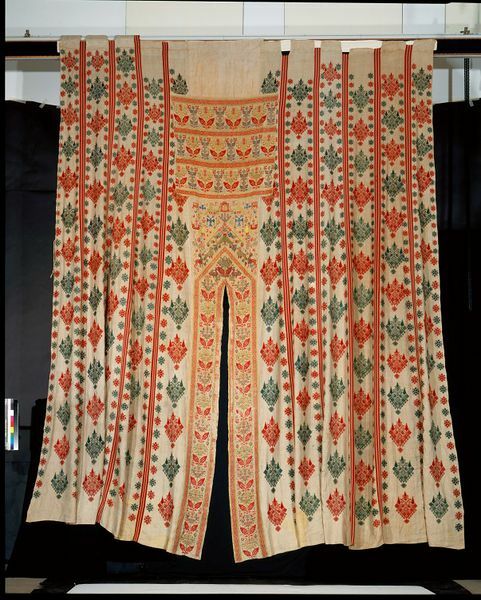 This type of pattern was also used in the bed curtains of Patmos. A door in the Benaki Museum (Benaki booklet Pl. 16) has this pattern in the panels and is in every respect similar to doors usually attributed to Kos, but it is very close indeed to the door of the bed tent under review, and to Cook Collection No. 50. The decoration of the gable and spandrels on a Koan door was not as traditionally well-defined as in Rhodes, but this one appears to be a typical example. The unit of King and Queen pattern over the gable, flanked by peacocks and parrots, was common (see also BFAC Cat. No. 67, 82.) The central position above the apex of the gable is sometimes filled by the lady-in-castle pattern as here (also in the Benaki door mentioned above), very often by a double headed eagle (Johnstone Pl. 59, BFAC Cat. Nos. 67, 82.) All these motifs, with ships, archers, leopards, stags and formalised flowers filled the space above the gable. Louisa Pesel, when she published this piece (Burlington X, 1907, p.236), suggested that the different motifs were worked in different islands to form a composite gift for presentation to some important person. (She states that some of the motifs have been worked separately and applied with chain stitch, but his not so. The rather bulky appearance is caused by outlining in chain stitch in silver thread.) This theory was refuted by Wace (Cook Coll. p. 27) and is now discredited. The usually lively stags interspersed among the King and Queen patterns of the door panels are repeated in the Benaki door attributed to Patmos (see above) and in Cook Collection No. 50. 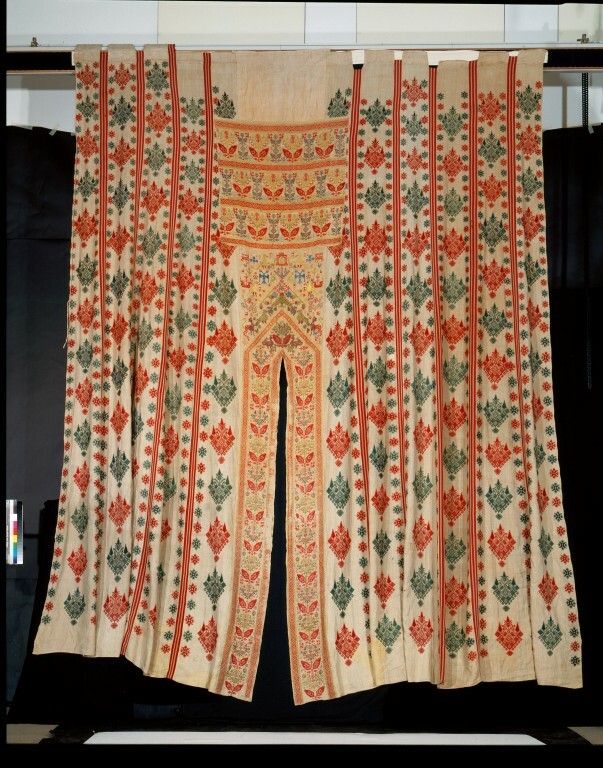 The stags in Kos door panels are usually seen the right way up, but among the King and Queen patterns of Patmos curtains they are often placed sideways, parallel with vertical border (Cook Coll. No. 52.) In Kos they are sometimes replaced by birds (Johnstone Pl. 59, BFAC Cat. No. 67, 82.) The door of this piece evidently did not belong to the tent originally. It has been worked on a different, finer linen, and sewn over two strips of the tent proper. Part of a bed tent door formerly attributed to Kos is listed under Patmos (T.92-1931).